Seed can be very easily obtained from many species of tree that can be found growing in fields, gardens and by the roadside. Many species of tree such as Oaks, Maples and Beech have instantly recognizable seedpods that once opened reveal large quantities of seed that can be used to create large numbers of new plants. There are also many retail outlets that sell 'bonsai seed'. 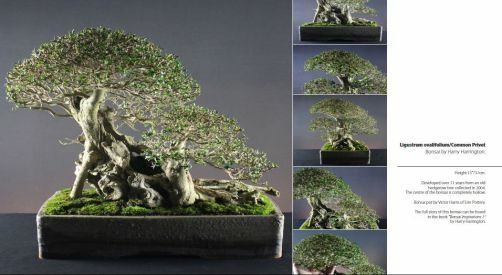 It should be noted that there is no such thing as 'special seed for bonsai', bonsai are created from ordinary trees not 'special bonsai varieties'. Packets of 'bonsai seed' are generally very overpriced and can be misleading, they simply contain seeds from trees that are suitable for use as bonsai. Some species of trees are relatively easy to grow from seed, Maple species, Black Pine, Scots Pine, Zelkovas, Beech and Larch are all species that are easy to germinate from seed. Others such as White Pine, Hornbeam and Needle Junipers can be more difficult. Though seed is very cheap and easy to obtain, it does have some drawbacks when propagating plants. It is a very slow process; seeds can take many months to germinate, some species can take a number of seasons for their seed to germinate and many species need exacting conditions to begin the process of germination. Many types of seed require periods of cold or mild temperatures or wet weather before they will begin the process of germination. When seeds have been successfully germinated, young seedlings will need a number of seasons of vigorous growth before they have thick enough trunks to warrant their use as bonsai. Typically, a tree grown from seed will take a further 4 or 5 years of vigorous growth to achieve a trunk just an 1" across. There are also many species of trees that readily cross pollinate and their seed will nearly always produce hybridized plants which may not display all the qualities of the parent plant. However, growing a tree from seed and watching it mature into a bonsai is an experience that every serious enthusiast dreams about and trees that are grown from seed, from their very inception, are a reflection of their owners patience. The ability of a seed to germinate depends on a number of factors; the quality of the seed or even whether it is still viable, the time of year, surrounding temperatures and importantly the temperature the seed has been previously exposed to, the manner of collection and storage, and importantly the matter of individual species' dormancy requirements. It is preferable to try to use fresh seed that has ripened within the past growing season; some trees seed can have a relatively short life span compared to flower or vegetable seed and old seed may not be viable any more. Seeds are biologically programmed to germinate in their native habitat when growing conditions are at their most favourable. For most species, this means that seeds that are released in late Summer and Autumn, go dormant for the period of the Winter and then germinate when the soil temperatures rise in the Spring. This dormancy means that seeds don't germinate immediately in Autumn as they fall from the tree; this would result in young seedlings that would be killed by the first frosts of winter. By germinating in Spring, a young seedling has an entire season to grow and strengthen in preparation for its first winter as a young sapling. This is a good example of why it is important to understand the need to try to imitate the natural growing conditions of an individual species to prompt it to germinate. The easiest species to germinate are nearly always those that are found locally; by virtue of the fact that these species are able to reproduce by seed also means that your local climate is favourable for germinating its seed. If a tree is able to germinate its seeds by simply dropping them onto the ground, so can you. Unless described otherwise in the Species Guides, seed can be sown in Autumn straight into a prepared seed bed or a pot outside, the effect of repeated freezing and thawing through the winter, followed by the gentle warming of the soil and increased light in Spring will break the seeds dormancy and it should germinate. This process of breaking dormancy is known as stratification. Stratification can be artificially created with the help of a refrigerator. This can be necessary when trying to germinate seeds out of season, seeds that have been stored inside over winter or seeds of species that will not germinate naturally in your local climate. Seed should be soaked in water for around 5 or 6 hours and then placed in a damp plastic bag at room temperature for 3 or 4 days. Seeds that are seen to soak when soaking in water are still viable for germination; any floating seeds are empty shells and will not germinate, these should be removed. Care should be taken with very small seed as they can all end up floating as a result of surface tension! The plastic bag of seed is then placed in the bottom of a refrigerator where the temperature is around 4°C. The bag is then slowly moved up the shelves in the refrigerator over a period of two weeks until it is placed on the top shelf where the temperature is just above freezing. Over a second two-week period the bag of seed is then slowly moved back down to the bottom of the refrigerator. The seeds can then be removed from the refrigerator and sown.